Here's one way that old-fashioned newsprint beats the Internet. Tulane University scientists have discovered a novel bacterial strain, dubbed "TU-103," that can use paper to produce butanol, a biofuel that can serve as a substitute for gasoline. They are currently experimenting with old editions of the Times Picayune, New Orleans' venerable daily newspaper, with great success. TU-103 is the first bacterial strain from nature that produces butanol directly from cellulose, an organic compound. "Cellulose is found in all green plants, and is the most abundant organic material on earth, and converting it into butanol is the dream of many," said Harshad Velankar, a postdoctoral fellow in David Mullin's lab in Tulane's Department of Cell and Molecular Biology. "In the United States alone, at least 323 million tons of cellulosic materials that could be used to produce butanol are thrown out each year." Mullin's lab first identified TU-103 in animal droppings, cultivated it and developed a method for using it to produce butanol. A patent is pending on the process. "Most important about this discovery is TU-103's ability to produce butanol directly from cellulose," explained Mullin. 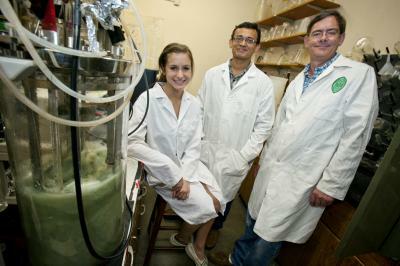 "This discovery could reduce the cost to produce bio-butanol," said Mullin. "In addition to possible savings on the price per gallon, as a fuel, bio-butanol produced from cellulose would dramatically reduce carbon dioxide and smog emissions in comparison to gasoline, and have a positive impact on landfill waste."